COCOON 501 is formulated for exterior surfacing of masonry, plywood, steel, etc. COCOON 501 is a liquid polyvinyl chloride coating which can be sprayed on any clean, dry building surface. Wherever it is sprayed, it forms a tough, strong permanent waterproof skin that is adaptable to most surfaces. 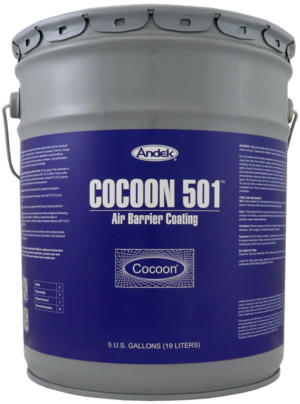 COCOON 501 seals against moisture, gases, corrosion, and particulates, and maintains excellent low temperature flexibility. A minimum surface profile of ½mm should be maintained for maximum adhesion. After proper masking, prime the entire sur-face to be coated with Vinyl Bond B, directly from the can, by spray or roller and allow the primer to dry. Close all penetrations through the surface by using a webbing coat. Webbing solution is made by mixing 1 part webbing agent with 3 parts Cocoon 501 to produce a milky, white solution that will support the following coats. Mix ½ gallon of Cocoon Pigment into a 5 gallon can of Cocoon 501 and mix until the color is uniform. Spray apply the mixed Cocoon 501 in multiple overlapping passes until a 20 mil dry film thickness has been achieved. Properly applied, the coating should be free of voids and pinholes. Voids and pinholes must be re-sprayed to achieve a complete seal. Prior to the removal of any protection or equipment, a thorough inspection of the entire area should be completed and all damage or deficiencies must be repaired and re-sprayed. All termination joints should be sealed with a polyurethane sealant.